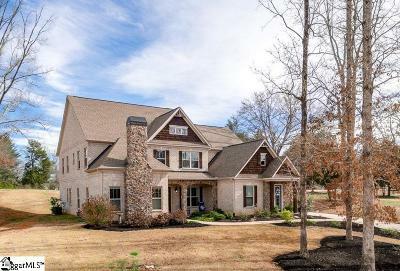 European-style stone arches gracing the top of the columns flanking the double front doors lead you into a haven of warmth, spacious peace and a place to call HOME. 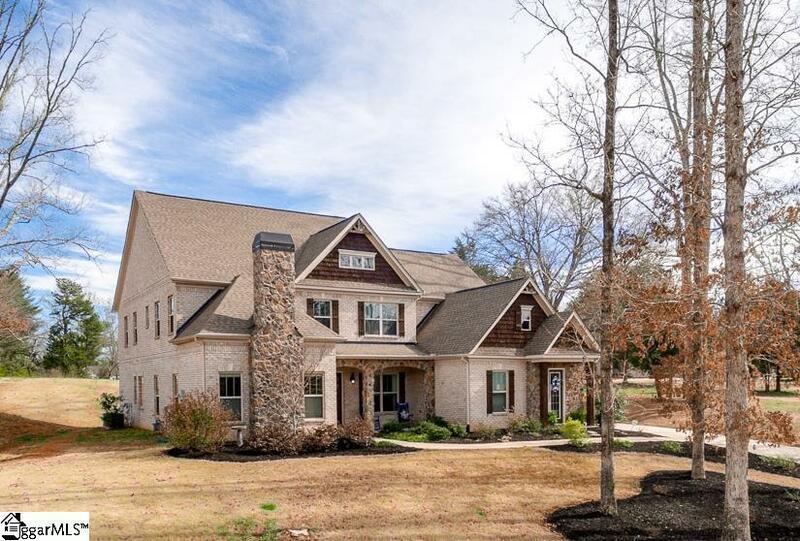 Nestled in the foothills of the South Carolina mountains just 2 miles from the heart of downtown Travelers Rest, 26 Wood Leaf Trail beckons you to escape the hustle and bustle of the busy world and relax on the front porch of serenity. Lounge in front of the great room wood fireplace, drawn into your favorite novel draped in a blanket of sunshine beaming through the triple picture windows. Enjoy your morning java in your gourmet kitchen complete with a large island, white granite countertops, deluxe gas range and large pantry. The formal dining room and butler&apos;s pantry make this a perfect setting for entertaining. At the top of the hardwood stairs, enjoy movie night in your large home theatre with 180" screen, surround-sound system small kitchenette complete with sink and minifridge. The corner guest suite second master connects to one full bath and the four additional bedrooms in a split-bedroom plan offer ample accommodations. Outside, enjoy dinner on the newly enlarged, textured patio or snuggle up in front of the large stone outdoor fireplace watching the sunset. The large master bath offers a tiled shower and separate soaking tub, huge double master closet and spacious double vanities. After relaxing in front of the gas fireplace in the cozy sitting area in the master bedroom, melt into your bed in the spacious main-floor master bedroom for many nights of the deepest sleep, resting in the knowledge that you&apos;ve found home. The charm of the downtown of Travelers Rest, Friday night lights of TR autumn nights, the Swamp Rabbit Trail and numerous unique shops and restaurants make this the perfect hometown for newcomers and longtime natives alike. Welcome Home.